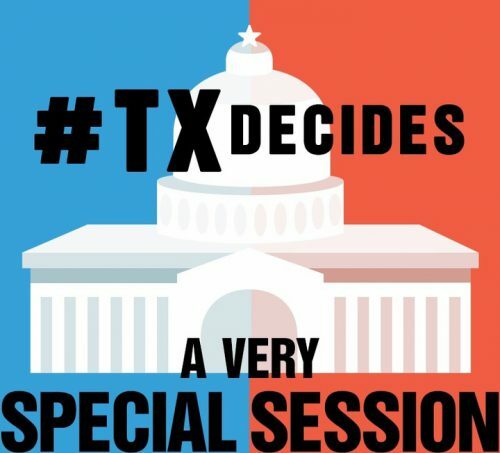 What Do You Want To Know About The Special Session Of The Texas Legislature? Tell Us! The 85th Texas Legislature ended with dramatic flair last month, leaving key legislation in the balance and tensions high between the House and Senate. And it’s not over: In July, lawmakers return to Austin for a special session. Texas has seen legislative overtime before, but nothing packed quite like this. First on the agenda: Sunset legislation required to keep state agencies, like the Texas Medical Board, open. But that’s not all. “If I’m going to ask taxpayers to foot the bill for a special session, I intend to make it count,” Gov. Greg Abbott said when announcing the special session. Once sunset legislation passes, Abbott has a 19-item wish list of issues for lawmakers to tackle. We know you have questions, and we want to answer them. Curious about sunset legislation? Wondering about an issue on the governor’s agenda? Just want to know how special sessions work? As part of the Texas Decides series, we want to shine some light on the often confusing inner workings of the big pink dome. We’ve teamed up with public radio stations across Texas – KUT in Austin, Texas Public Radio in San Antonio, Houston Public Media, Abilene Public Radio and Marfa Public Radio – to collect and answer your questions. Vote for your favorite question or send in one of your own using our modules at the bottom of the page. This entry was posted in KRTS News, KXWT News and tagged 85th Legislative session, special session, TXDecides. Bookmark the permalink.